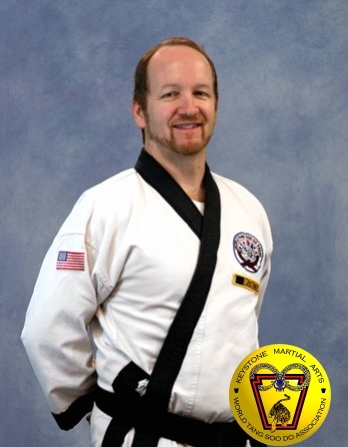 Master Mark Jorgensen is a certified fifth degree black belt instructor in the World Tang Soo Do Association. He began his martial arts career at the age of 10 under Master Charles Vaughn. He did not then realize	he would be undertaking a journey that would shape much of who he is today. Master Jorgensen attained his first degree black belt in July of 1989 and was by that time assisting in the instruction of youth classes. In July of 1991, he was awarded his second degree black belt, and at age 18 received official Instructor's Certification. Master Jorgensen graduated with honors from Boyertown Senior High School in 1992 and enrolled at Penn State University. While at Penn State, he continued his training at the university with Master Michael Kaye. He assisted in teaching classes with the Penn State Martial Arts Group and was promoted to third degree black belt in July of 1994. Master Jorgensen graduated from Penn State with a BS in Secondary Education, and believes strongly in the value of education at all levels. He has over 25 years of experience in the martial arts and has taught in YMCAs, on a university campus, and in commercial martial arts studios. Although not his main focus, he has also had the honor of winning six Grand Championships at various competitions. At the 2004 World Tang Soo Do World Championship in Orlando,Florida, Master Jorgensen realized a lifelong dream when he was presented with his Master's belt by Grandmaster Jae C. Shin. On October 2, 1999, Master Jorgensen was married to the love of his life, without whom he could never have come this far. The Jorgensens now operate Keystone Martial Arts together, strongly believing in the value of families training together. Master Jorgensen's personal philosophy is that we are all both teachers and students. There is a need in this world to pass on what we have learned and an equal need to make the attempt to learn from everyone we meet regardless of age, gender, or status. It is his hope that he can continue to spread the art of Tang Soo Do to new locations and in the process continue to learn from new groups of people. In February of 2008, Master Jorgensen was featured on the World Tang Soo Do Association's website as the "Master of the Month". You can view this profile by clicking here. In July of 2012, after completing the required two year testing process, Master Jorgensen was awarded the rank of Oh Dan, Fifth Degree Black Belt, by Grandmaster Robert E.Beaudoin at the WTSDA World Championship in Greensboro, North Carolina. 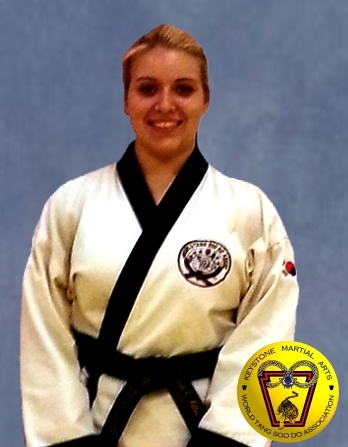 Mrs. Richelle Jorgensen is a certified third degree black belt instructor in the World Tang Soo Do Association. 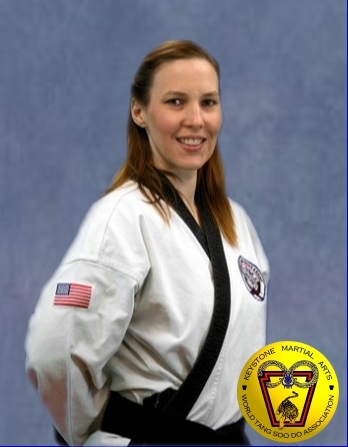 Mrs. Jorgensen began her martial arts career at the age of 10 in the International Tang Soo Do Federation under the instruction of Mr. Wayne Giansante. Mr. Giansante gave her a firm foundation in precision techniques and showed her the beauty of the art in "martial arts". During her 9 years with I.T.F., she obtained her second degree black belt. Mrs. Jorgensen graduated with honors from Hopewell Senior High School in 1993 and enrolled at Penn State University. She spent two years at Penn State Beaver Campus before transferring to University Park. It was at this time that she was introduced to the World Tang Soo Do Association. In 1995, she joined the Association and began training with the Penn State Martial Arts Group under the instruction of Master Michael Kaye. Mrs. Jorgensen had the unique experience of being able to train in Tang Soo Do as a white belt for a second time, which has given her a chance to put the World Tang Soo Do Association's sixth Tenet "Humility" into practice. Within two years, she tested for her first degree black belt within the World Tang Soo Do Association. In 1998, Mrs. Jorgensen graduated from Penn State with a BS in Real Estate and International Business and a minor in German. 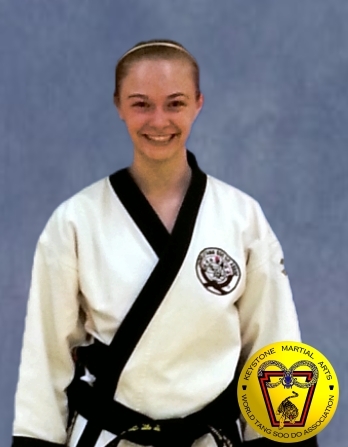 During her time with the Penn State Martial Arts Group, she met Mark Jorgensen. Almost two years passed before the two began dating, and they were soon inseparable. In October of 1999, they became Mr. and Mrs. Mark Jorgensen and began a new chapter in their martial arts careers. June of 2002 brought about the birth of Keystone Martial Arts. Together the Jorgensens strive to make their schools successful by combining their different martial arts histories and their similar philosophies. Both instructors desire to maintain a positive learning atmosphere, emphasize the importance of families and family values, and spread the influence of the strong, moral values that the World Tang Soo Do Association represents. In 2011, Mrs. Jorgensen was inducted into Region 22's Hall of Fame as Instructor of the year, recognizing her hard work not only at Keystone Martial Arts, but also throughout the Region and the WTSDA. 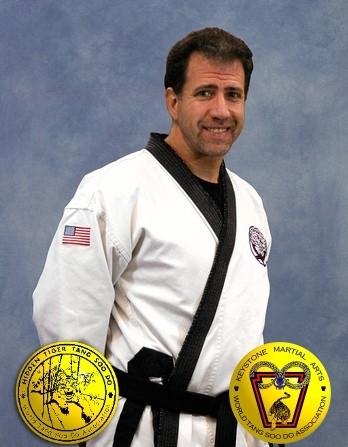 Mr. Robert Greco is a certified third degree black belt instructor in the World Tang Soo Do Association. 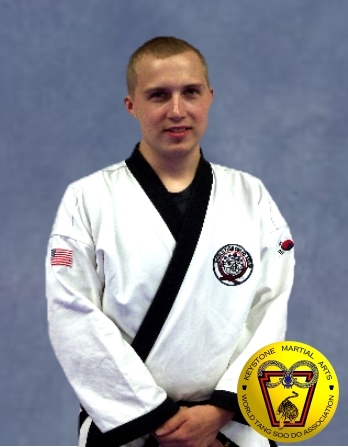 He began his training in Tang Soo Do at Keystone Martial Arts in June of 2002. Studying under Master and Mrs. Jorgensen, he achieved the rank of first degree black belt in October of 2005. Initially Mr. Greco started training to spend quality and productive time with his eldest daughter, who was then eight years old. Both he and his daughter started training on the same day and received their black belts on the same day. For Mr. Greco, Tang Soo Do soon became a personal passion as well as a common thread both he and his daughter will share. During the summer of 2003, Mr. Greco began his instructor apprenticeship under Master Jorgensen. 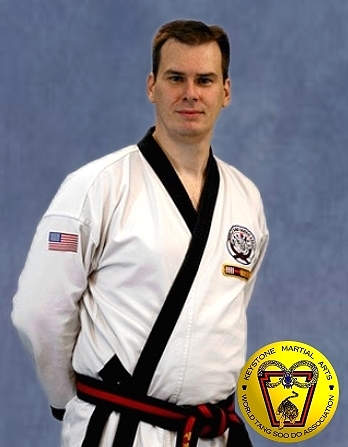 In February of 2006 he received full instructor certification from the World Tang Soo Do Association. For Mr. Greco the most rewarding aspect of teaching is taking part in the development of youth students. Witnessing a student's achievements, both mentally and physically, has its own rewards. 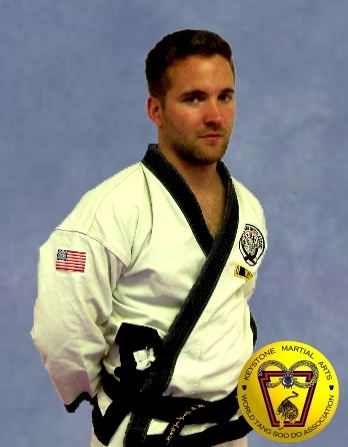 As well as studying martial arts, Mr. Greco is employed by Carnegie Mellon University. He has worked as an analytical instrument engineer for the Department of Chemistry for the past 19 years. In his spare time, Mr. Greco enjoys playing guitar and tinkering with his classic Mustang. In June of 2004, Mr. Greco's wife and his youngest daughter began their training in Tang Soo Do. They received their black belts together in June of 2008. Keystone Martial Arts and the World Tang Soo Do Association have definitely been a family adventure. In June of 2012, ten years after they began their journey in Tang Soo Do, the Greco family embarked on a new chapter by opening their own studio at the Butler YMCA, named Hidden Tiger Tang Soo Do. Although their regular presence will be missed at Keystone Martial Arts, we wish them all the best in this new endeavor. Mr. Ron Carter is a certified second degree black belt instructor in the World Tang Soo Do Association. He began training at Keystone Martial Arts in February of 2003 at the age of 39. Mr. Carter decided to join the school after watching his oldest son train and develop for eight months. Under the patient tutelage of Master and Mrs. Jorgensen, and later Mr. Greco, he achieved the rank of first degree black belt in November of 2006 at the same time as his son. He now shares the bond of Tang Soo Do with his two older boys, both black belts, as well as his daughter. He looks forward to the day when his youngest son is old enough to begin training. Mr. Carter earned his Instructor Trainee status as a Cho Dan Bo in October, 2005. Now a full Instructor, teaching has become his favorite part of studying Tang Soo Do. He strives to teach students how to protect themselves from potential predators while maintaining a positive outlook and constructive teaching style. He stresses the need for discipline and focus in training and in being prepared for any given situation. When not in the Dojang, Mr. Carter is the President and Executive Director for The Strand Theater Initiative, a non-profit corporation he co-founded to revive the landmark theater in Zelienople as a performing arts, education and community outreach center. 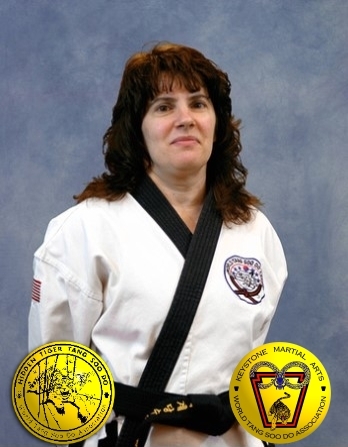 Mrs. Dianne Greco is a certified second degree black belt instructor in the World Tang Soo Do Association. Mrs. Greco received her black belt on July 1, 2008 with her youngest daughter. �We were looking for a family activity we could all participate in,� she said, �when my oldest daughter brought home a flyer from school." The YMCA was starting classes. Mr. Bob Greco and their oldest daughter joined first, as their youngest daughter was too young at the time. Mrs. Greco waited until her younger daughter was older so they could train together. She says that Karate is incorporated in her everyday life because she�s learned to be more efficient at work and at home. Her favorite parts of being a black belt are visiting other studios, participating in the Gup tests, helping in class and functions, and being part of a Tang Soo Do family. In June of 2012, ten years after they began their journey in Tang Soo Do, the Greco family embarked on a new chapter by opening their own studio at the Butler YMCA, named Hidden Tiger Tang Soo Do. Although their regular presence will be missed at Keystone Martial Arts, we wish them all the best in this new endeavor. 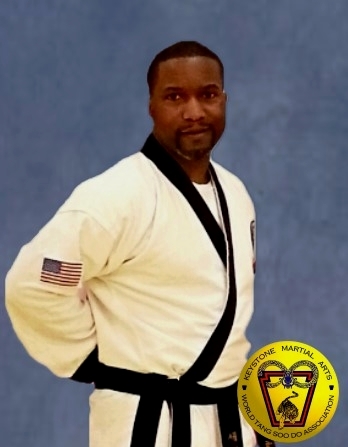 Mr. Anthony Williams is a certified first degree black belt instructor in the World Tang Soo Do Association. Throughout his youth and young adult years, Mr. Williams trained in a variety of martial arts, including Tae Kwon Do, Kenpo Karate, and Wu Shu. Looking for ways to spend quality time with his son, who had begun his training eight months earlier, Mr. Williams decided to join the school and began his training in Tang Soo Do at Keystone Martial Arts in May of 2009. Due to, in his own words, the expert guidance and teachings of Master and Mrs. Jorgensen, he was promoted to the rank of black belt in November of 2012. Mr. Williams began his teaching apprenticeship as a Cho Dan Bo in June of 2012. The study of Tang Soo Do has developed into a passion for Mr. Williams, but the most satisfying experience has been the opportunity to give back by aiding in the teaching and growth of the youth students. Mr. Williams believes that martial arts teach structure, and discipline, which produces confidence and contributes to the personal growth of the students, having an impact for the rest of their lives. In addition to martial arts training, Mr. Williams is a graduate from the University of Pittsburgh with a BS in Mechanical Engineering and a concentration in Manufacturing. He has held a variety of positions in the field of engineering over the years, and is currently employed as a Sr. Product Engineer and Sr. Project Manager for Underground Solutions, Inc.
As a member studio of the World Tang Soo Do Association, ALL of our instructors are required to pass an Instructor's Certification Program. Furthermore, our instructors constantly improve their teaching skills through instructor classes, training camps, and seminars. Our training programs are designed to give students an opportunity to ask questions and receive qualified answers from qualified instructors. Our classes are designed to be fun and exciting, while at the same time teaching our students that what they are learning is very serious and that they should not take their skills lightly or use the martial arts to bully others.